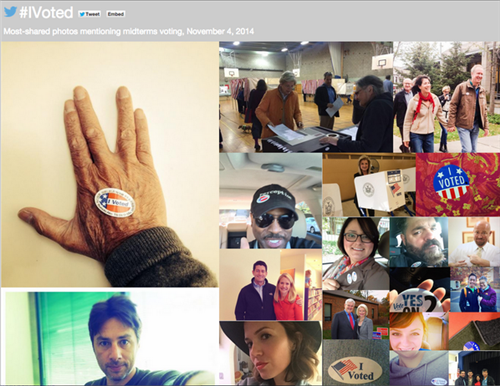 It’s Election Day 2014! With control of the U.S. Senate hanging in the balance, voters across the nation are heading to the polls to cast their ballots after a roller coaster midterm election cycle. There are 36 Senate seats up for grabs this year, 36 governorships and all 435 U.S. House seats. 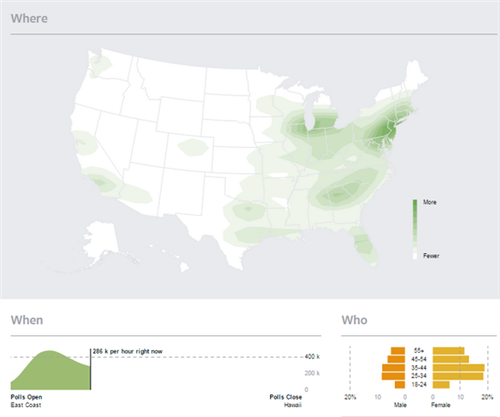 ABC News will be live blogging the results. Well, folks, thanks for following along with our live blog. 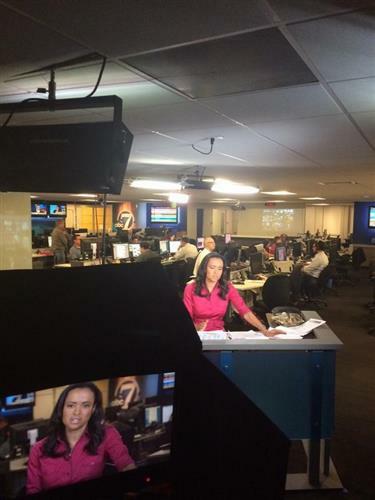 Be on the lookout for updates and analysis from our political team tomorrow morning at abcnews.go.com/politics. POTUS is monitoring returns at the White House tonight and has spoken w House, Sen & Gov candidates of both parties. 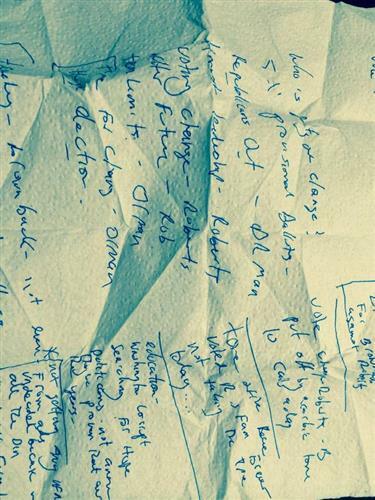 More details in the am. ABC's ALI DUKAKIS: No longer “Invisible” as he once lamented in a hit single, 2003 American Idol runner-up Clay Aiken won’t be adding a congressional seat to his resume. Insisting he’s hung his hat up from the music business -- shy of a spontaneous breakout in song on the campaign trail -- the former crooner reportedly decided to run against Republican Rep. Renee Ellmers to combat deep disenchantment with Congress both in his district and across the country. With 97 percent of votes counted and with a margin of 59-41, ABC News projects Ellmers will return to Congress after this year’s Lame Duck session comes to a close. Aiken was not able to reverse the tides in the district where Ellmers dethroned seven-term Democratic incumbent Bob Etheridge in 2010. ABC's JOHN PARKINSON: In one of the most closely watched races of the midterm election, Wisconsin incumbent Republican Gov. Scott Walker has defeated Democratic challenger Mary Burke, ABC News projects. Walker, a possible contender for the GOP presidential nomination in 2016, wins his third gubernatorial election in four years – becoming the first governor to achieve the feat in U.S. history. On October 28 in Milwaukee, President Obama made a rare campaign appearance with Burke, a former business executive and commerce secretary under former Democratic Gov. Jim Doyle. Her loss is a major disappointment for state and national Democrats, who were hoping to take Walker out of the 2016 presidential conversation before it began. It’s just after 10 p.m. EST, and polls are closing in Iowa, where senatorial candidate Bruce Braley, D, has gone head-to-head with the hog-castrating Joni Ernst, R. Also closing: Montana and Nevada. ABC's BEN SIEGEL: Based on our exit poll and our analysis of the vote in so far, ABC News projects that Republican Congressman and businessman Steve Daines will win the Montana Senate race against state Rep. Amanda Curtis. Republicans were widely expected to pick up the seat held by Democratic Sen. John Walsh, and have now flipped four Democratic seats. Walsh, a former lieutenant governor and retired National Guard colonel, bowed out of the race in August following a New York Times report that he plagiarized his 2007 master’s thesis for the Army War College. Montana Democrats replaced Walsh with Curtis, a 34 year-old teacher with a nose ring and YouTube video blog. Curtis, with her background in labor activism and support for gun control, was not expected to win in Montana. HOW BIG WOULD A VIRGINIA UPSET BE? 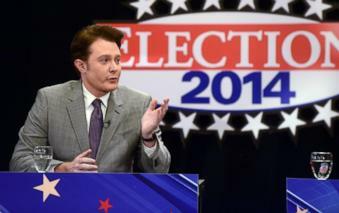 ABC's CHRIS GOOD and SHUSHANNAH WALSHE: It’d be really big—the upset of the night. 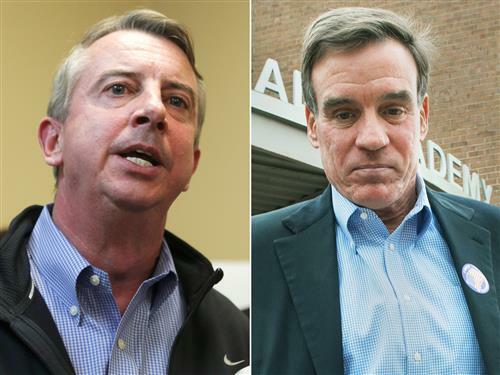 Against all expectations, Republican Ed Gillespie (49%) leads Democrat Mark Warner (48%) with 86% of the expected vote counted in Virginia’s Senate race. Everyone, including ABC News, rated Warner as the likely winner here, and no major prognosticators rated the race as a tossup. The last reliable poll, conducted in late October, showed Warner ahead by nine percentage points. Most strikingly, Warner won his last race by more than 30 percentage points, beating Jim Gilmore 65 percent to 34 percent. Democrats Tim Kaine (’12) and Jim Webb (’06) won Virginia’s last two Senate races, by much closer margins, but still: Democrats have been on a roll in Senate races in Virginia, and no one expected Warner to stop that trend. ABC’s JOHN PARKINSON: Democrat Seth Moulton has defeated Republican Richard Tisei, who was hoping to become the first openly-homosexual non-incumbent Republican elected to the House of Representatives, ABC News projects. With 52 percent of the vote counted, Moulton leads Tisei 56-39. Rep. John Tierney defeated Tisei in his first campaign for the House in 2012 and the political rivals had looked toward a rematch this fall before until Tierney was defeated by Moulton in their primary. Moulton, a Harvard-educated Democrat and former Marine Corps officer, served four tours of duty in Iraq. House Republicans may still get their first openly-gay non-incumbent Republican elected to the House if Carl DeMaio can knock off incumbent Democratic Rep. Scott Peters. 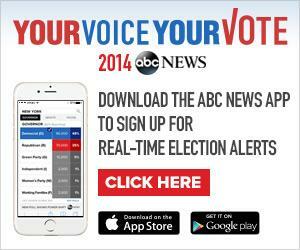 LOUISIANA SENATE RACE WILL PROCEED TO RUNOFF BETWEEN LANDRIEU AND CASSIDY, ABC PROJECTS. ABC's ARLETTE SAENZ and JORDYN PHELPS: The Louisiana Senate race is heading into a December run-off as no candidate was able to secure 50 percent of the votes Tuesday. 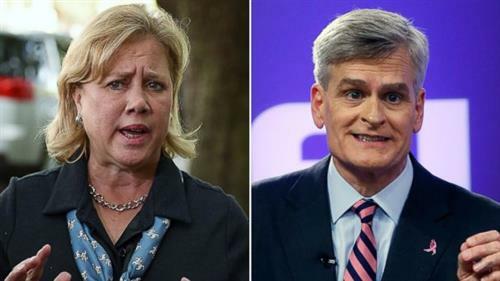 Based on preliminary exit polls, ABC News projected Sen. Mary Landrieu, D-La., will face-off against Rep Bill Cassidy, R-La., in the run-off. ABC's ALI WEINBERG: ABC is projecting Illinois Issue 1, a nonbinding advisory vote that would indicate voters’ preference to raise the state’s minimum wage to $10, as passing. Even though the state is not compelled to implement the ballot measure, putting a minimum wage question on the ballot is a surefire way to drive more people (usually Democrats) to the polls who might otherwise stay home in a midterm election. 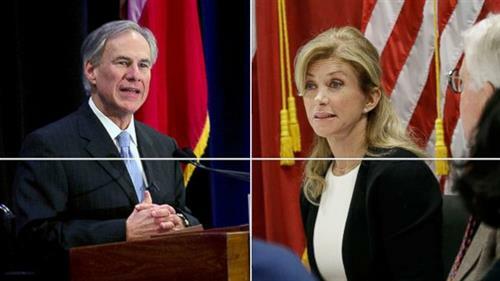 ABC's ALEX MALLIN: Based on our exit poll, ABC News projects that Republican Greg Abbott has defeated Democrat Wendy Davis in the race for Texas Governor. The race to replace Gov. Rick Perry was thrust into the national spotlight after Davis emerged as a star after her her 11-hour filibuster to block an anti-abortion bill last summer. From the beginning, however, Davis faced a long uphill climb. The Lone-Star state hasn’t elected a Democratic governor since 1990, and Abbott made a name for himself among conservatives after battling to the Supreme Court to keep the Ten Commandments on display on the grounds of the State Capitol complex in Austin. ABC's GARY LANGER: According to the preliminary exit poll data, here are three facts about voters in Arkansas, where Democratic incumbent Mark Pryor is fighting 5to keep his seat from Republican Tom Cotton. • Discontent among Arkansas voters is among the highest in the country; 72 percent think the country is headed seriously off on the wrong track and two-thirds disapprove of Obama’s job performance. • A majority, 54 percent, think the healthcare law went too far. • Turnout among Democrats is at a low, 29 percent, in Senate exit poll data since 1992. ABC's GARY LANGER: National exit poll data shows West Virginia has lowest approval rating of Obama and highest percentage of voters who think the country is on the wrong track. ABC's CHRIS GOOD: The midterms’ estimated cost of $3.67 billion, according to the Center for Responsive Politics, is higher than the GDPs of countries like Liberia, Central African Republic, Eritrea, and the Maldives. 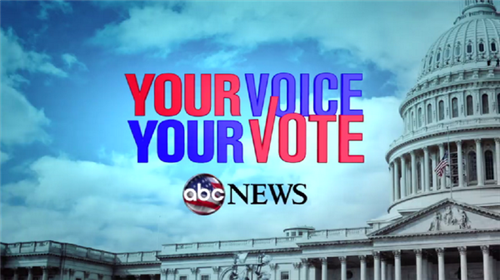 ABC's BEN SIEGEL: You can’t win every vote. 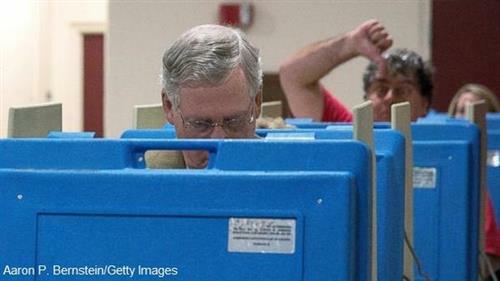 One Kentucky voter showed his disapproval for Senate Minority Leader Mitch McConnell Tuesday when he ran into the senator at a Louisville polling location. 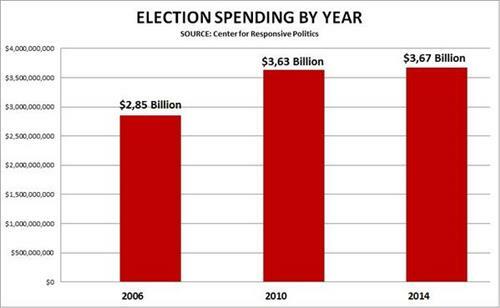 ELECTION SPENDING IS HIGHER, BUT NOT BY MUCH. 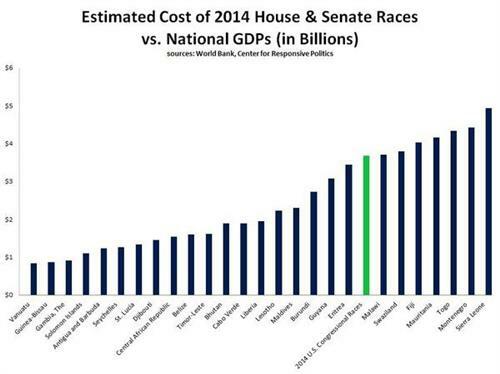 ABC's CHRIS GOOD: House and Senate races in 2014 will cost $3.67 billion, the Center for Responsive Politics estimates. That’s higher than the $3.63 billion spent in 2010, and the $3.66 billion spent on congressional contests in 2012, but it’s not that much higher. Those totals don’t include undisclosed spending by groups like Americans for Prosperity, a 501c4 nonprofit that doesn’t report its election spending to federal campaign regulators. The Center estimates that money will be “well over” $100 million, so it’s tough to say how much the elections will really cost. 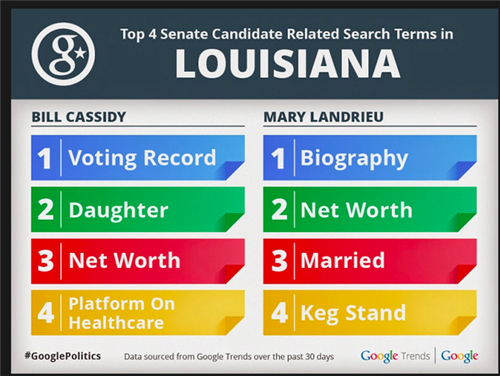 ABC's JORDYN PHELPS: If Google search trends are any indication of what’s on voters’ minds, it would seem that keg stands are a top issue in the Louisiana Senate race. Google reports that “keg stand” is the fourth most searched term related to vulnerable incumbent Democrat Sen. Mary Landrieu in Louisiana. In September, Landrieu assisted a man in drinking from a keg stand at an LSU tailgating party and the incident went viral on social media. ABC’s GARY LANGER: While we watch the blow-by-blow of tonight’s returns, we might also step back and see what they say about where we’re at as a country. We’re in a recurring pattern of electing presidents, then, two years later, giving their party an especially hard kick in the shins. We re-elected G.W. Bush in 2004, then whomped his party for 30 House and six Senate seats in 2006. We elected Barack Obama in 2008, then whacked the Democrats for 63 House seats and six in the Senate in 2010. We re-elected Obama in 2012 – and look set to hit his party again. Midterm losses for the incumbent president’s party are the norm, but lately they’ve been super-sized. Beyond the well-documented differences in midterm turnout, it speaks to two realities: One, the public’s long-running economic and political discontent; and two – an outcome of that discontent – a decade-long departure from traditional political loyalties. Independents have outnumbered either Democrats or Republicans by a greater margin, and for longer, than we’ve ever seen before. That encourages political instability. Even with gradual economic recovery under way, Americans still are beaten down by the longest, deepest downturn since the Great Depression, and likewise disaffected from politics, with a broad sense that the system simply doesn’t work. From the government shutdown and the botched Obamacare rollout a year ago and on to the threats posed by everything from ISIS to Ebola, with economic anxiety overlaying it all, the public is just not seeing the solutions it seeks. Obama’s approval rating is low, but confidence in Congress and in both parties is lower still. The Republicans may benefit tonight by not being the Democrats, but beyond that, they don’t have much independent appeal. No one in Washington does, and that’s a big part of what the discontent – and the voting cycles it’s fueling – are all about. @ThomTillis, you have run a wonderful campaign. Good luck today! 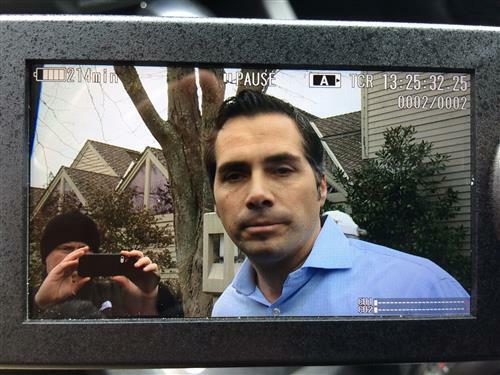 ABC's RICHARD COOLIDGE: After casting his vote today, independent Kansas Senate candidate Greg Orman said his campaign was "a tremendous opportunity for the voters of Kansas." "We feel great...we think we've run a really good campaign and we're excited about the opportunity to potentially represent Kansans in the United States Senate," Orman said. "We feel really good about where we are and just hoping people go out and vote today." "This campaign is really a tremendous opportunity for the voters of Kansas to send a message to the politicians of both sides in Washington that you've got to end the gridlock. You've got to roll up your sleeves, get to work and start solving problems for the American public and we're really hopeful that the voters of Kansas will send that message today," he added. Orman hasn't announced whether he'd caucus with the Democrats or the Republicans -- so if he wins, both parties will be vying for his support.